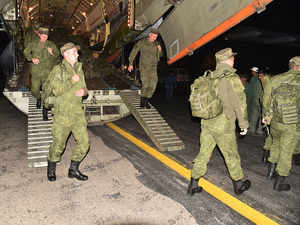 In this handout photograph released by Pakistan's Inter Services Public Relations (ISPR) on October 22, 2018, Russian troops come out from military plane upon their arrival at a Pakistani military base at an undisclosed location. ISLAMABAD: The just-concluded joint military exercise between Pakistan and Russian armies has reinforced the existing relationship between the two militaries, according to Pakistan Army chief General Qamar Bajwa. The Pakistan and Russian armies conc luded the third joint military drill on Sunday during which troops from both the countries took part in various exercises and also exchanged mutual counter-terrorism experiences. A Russian Army contingent arrived here on October 22 to take part in the third edition of a joint bilateral military training exercise, Druzhba-III. The two armies conducted various drills in the mountains in Nowshehra district of northwestern Pakistan till November 4, which was also witnessed by Gen Bajwa. "This exercise is great forum to reinforce existing relationship between the two militaries," the Pakistan Army Chief said. Gen Bajwa also visited the National Counter Terrorism Centre in Pabbi in Nowshehra. "The exercise focused on counter-terrorism training of the Special Operation Forces of Pakistan and Ground Forces of Russian Federation while exchanging mutual counter terrorism experiences," the Pakistan Army said, adding the Chief of Army Staff appreciat ed the participating troops for their dedication, skill and professionalism. Russian Deputy Head of Mission in Pakistan, Valadamir Betezyuk was also present. Pakistan and Russia are trying to bolster defence ties and in August this year they inked an agreement allowing Pakistani troops to train in Russia. The two countries have been holding the 'Friendship' drills since 2016. In October 2016, they held their first-ever joint military exercise in Pakistan. In 2017, over 200 servicemen took part in the drills, hosted by Russia at Minralney Vody in the North Caucasus at an altitude of 2,300 meters above sea level. Over the past three years, Russia has supplied four Mi-35M combat and cargo helicopters to Pakistan. Safest way to send money to your loved o nes in India!